There are times when one wishes human cloning could be a reality outside of science fiction. This weekend would be one of those times for me. For some inexplicable reason, Sunday in particular has become one of the busiest, non-convention-related days I’ve seen in quite some time. Saturday has some pretty cool stuff, too, which could be impacted by presidential travel closing key routes to people trying to go places. There’s quite a bit to get to, so let’s get to the rundown! Stan Sakai visits McCully-Moiliili Library: Fresh off an appearance at Maui Comic Con, the kamaaina creator of rabbit ronin Usagi Yojimbo will be giving a talk at 10:30 a.m., signing autographs ($5 for up to three signatures) and doing quick sketches ($5 each) in a benefit for the library. Collector Maniacs will also have four rare Usagi Yojimbo individually numbered, hardcover collections for sale for $125 each: “Fox Hunt” (vol, 25, no. 202 of 350), “Traitors of the Earth” (vol. 26, 94 of 350), “A Town Called Hell” (vol. 27, 136 of 350) and “Red Scorpion” (vol. 28, 109 of 350). 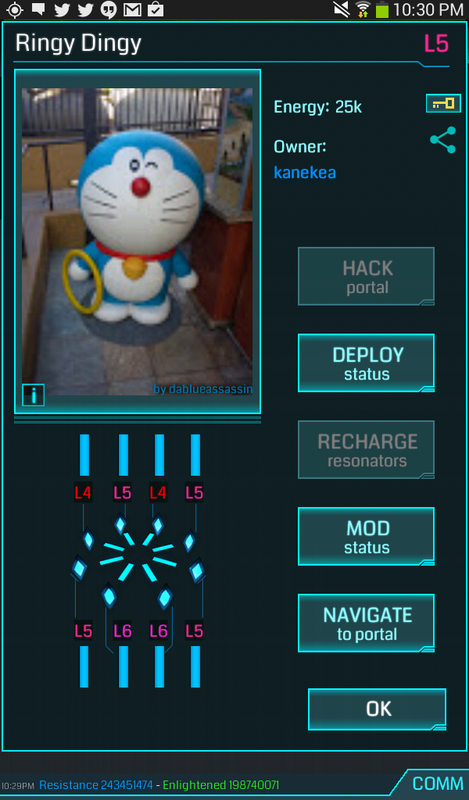 Also, see those Usagi dolls at the top of this post? You can enter to win one of those. The library is at 2211 S. King St.; arrive early to grab some parking. Artists’ corner: Cacy & Kiara / Highball & Pepe author Roy Chang will be selling things at the Aiea High School PTSO Craft Fair from 9 a.m. to 2 p.m. at the high school at 98-1276 Ulune St. Marisa and Carole Gee of Kawaii Mono will be selling their jewelry on the Uptown side of Pearlridge Center from 10 a.m. to 7 p.m.
Anime Day 4.0: Kawaii Kon’s mini-con experience is back for a fourth year (and its second at the Shirokiya Japan Village Walk complex at Ala Moana Center). Trivia master extraordinaire Remy Zane will be presiding over a number of games and activities, including a cosplay contest. Comic Jam Hawaii will host the art wall, where anyone can pick up a pen and sketch whatever they want (within acceptable family-friendly parameters, of course). 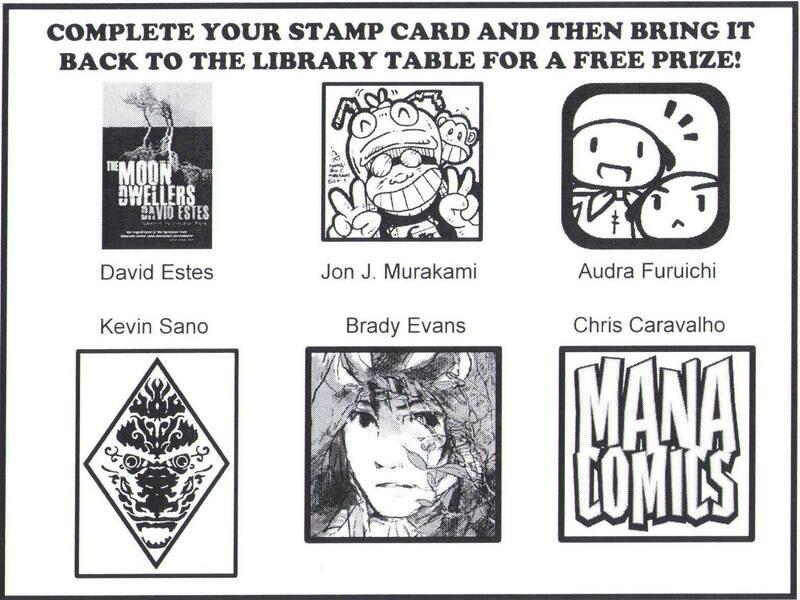 A bunch of artists and crafters (including Jon Murakami and Kawaii Mono!) will be selling their wares as well. 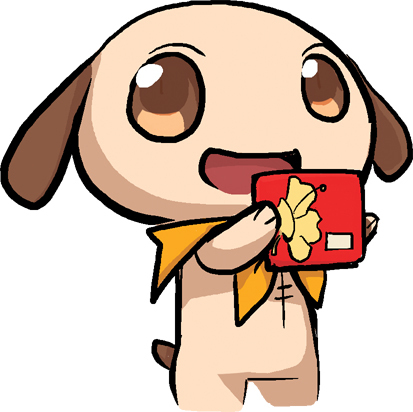 Take advantage of Kawaii Kon’s preregistration special and pick up a three-day pass for next year’s con for $55, too! 10 a.m. to 3 p.m.
Hawaii Toy Fair: If you’re looking for some rare, hard-to-find collectible or just want to stare slack-jawed at just how many Funko Pop figures have been produced over the past few years, this event, packed with more than 50 dealers, can probably help you out. Special guests include Marvel and DC artist Mark Texeira and Game of Thrones storyboard artist Mog Park. Ala Moana Hotel, Hibiscus Ballroom. Admission is $3, but children 5 and under, as well as all cosplayers, can get in free. Visit hawaiitoyfair.com. 8 a.m. to 4 p.m.
Japanese voice actors visit Waikiki Yokocho: This is one of the more surprising events to come down the pipe in some time, so here’s the deal: Voice actors Ryo Horikawa (Vegeta in Dragon Ball Z, Andromeda Shun in Saint Seiya, Heiji Hattori in Detective Conan/Case Closed) and Takumi Kamada (Frederick Ando in Ame-iro Cocoa Series: Ame-Con! 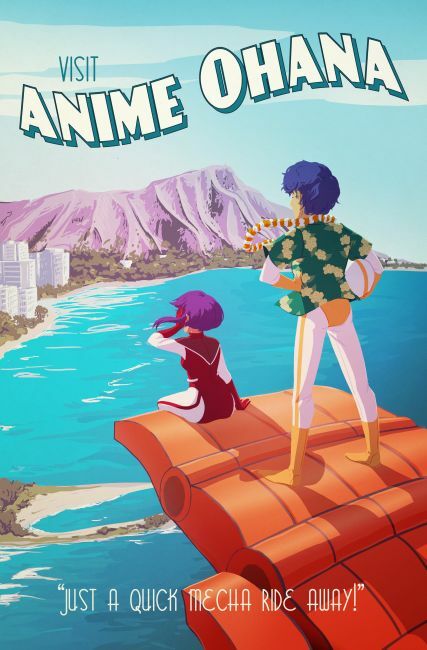 !, currently streaming on Crunchyroll) will join musician Kaoru Kondou for a special event at Waikiki Yokocho, the Japanese food alley in the basement of the Waikiki Shopping Plaza (2250 Kalakaua Ave.). The common thread between the three: All of them worked on an anime series about a coffee shop called Rainy Cocoa, which, in its third season, featured a branch opening in Hawaii. So there you go. They’ll be doing a talk show, an autograph session and a mini concert starting at 1 p.m. You can get full details about the event from this flyer. Movie screenings: Fathom Events’ first showing of Pokemon the Movie: I Choose You!, a retelling of the origin stories of Ash and Pikachu, and the Hawaii International Film Festival’s first showing of Napping Princess, where a girl’s mysterious dream world is the key to saving her father after he’s arrested for stealing technological secrets, will be at 12:55 and 2:30 p.m., respectively, at the Regal Dole Cannery Stadium 18 complex. 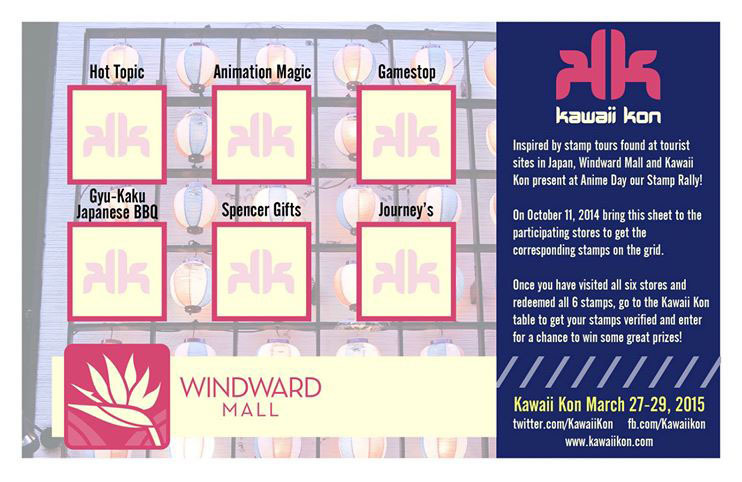 I’ll get back to part 2 of the otaku film feast-ival next week, but for now there are more pressing matters at hand: namely, there’s an Anime Day coming up at Windward Mall from 10 a.m. to 4 p.m. Saturday and, aside from how I’ve said that a) it’s totally a thing and b) those of you who preregistered for Oni-Con Hawaii will want to bring proof of registration to pick up your free DVD, I haven’t had a chance yet to fill in some of the finer details about it. … and participants in the Iron Cosplay contest. The vendors room — again across from Glow Putt Mini Golf on the second floor, in what I think was the old Suncoast Video space — will feature a number of local crafters, including Gordon Rider/Star-Advertiser “Calabash” cartoonist Jon Murakami and idkwhat2wear. Artists can participate in a number of activities as well. Roy Chang, MidWeek cartoonist, Aiea Intermediate art teacher and keeper of Pepe the chihuahua, will offer tips on improving art at his portfolio review booth. 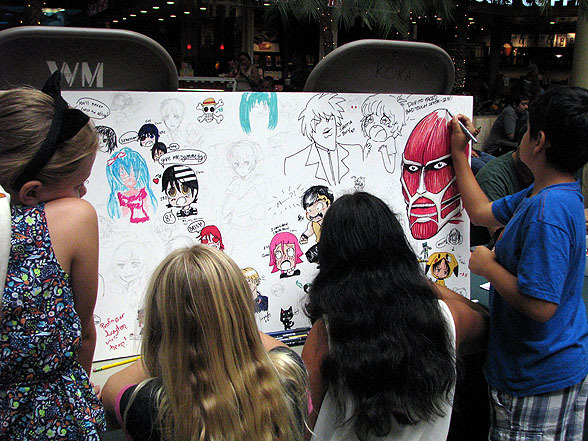 Comic Jam Hawaii is hosting the sketch wall, while MangaBento will have tables with coloring and craft worksheets. 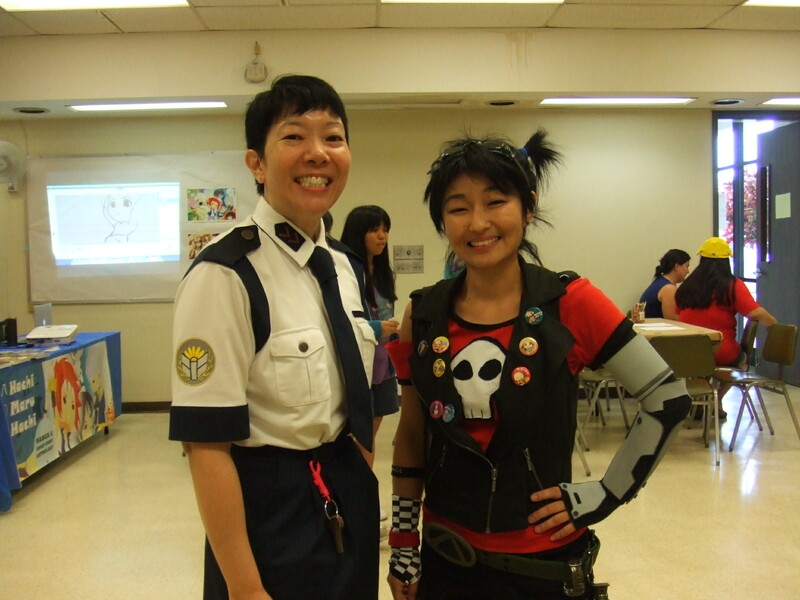 You can preregister for Kawaii Kon 2015, too! 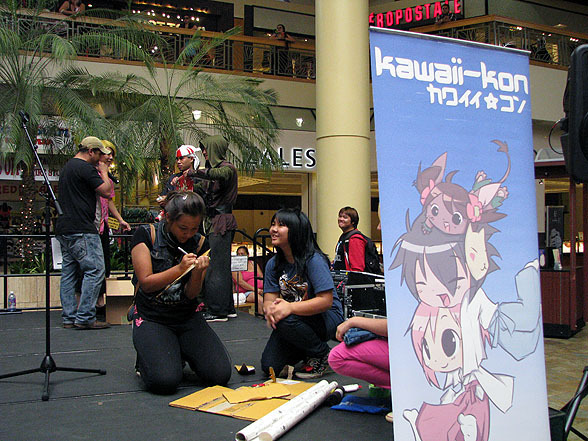 For the latest info on all things Kawaii Kon, visit www.kawaii-kon.org or www.facebook.com/kawaiikon. Welcome to October, the month where, if you can’t find some event that interests you, you have to start questioning whether your heart’s really still into this anime/manga fandom. 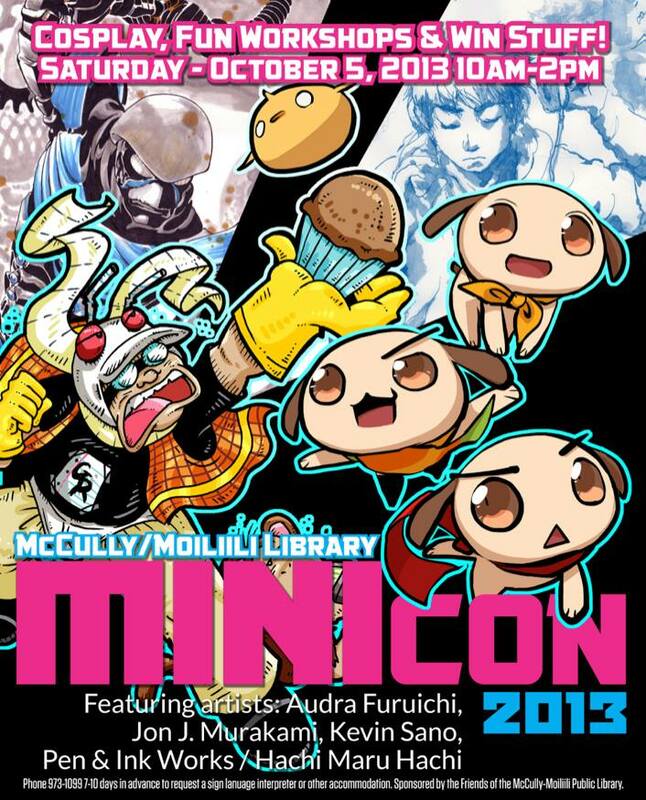 A bunch of major players are hosting events this month: Kawaii Kon. The Hawaii International Film Festival. Taku Taku Matsuri. 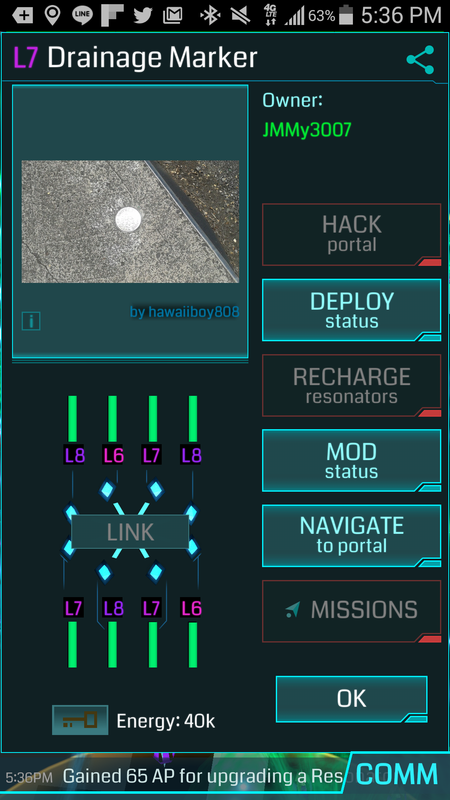 Oni-Con Hawaii (yes, I’m counting them now even though it’s a November event, because I’m checking in to my hotel Halloween afternoon and will probably be too busy covering it to be able to write them into the November Ota-cool! calendar, so yay). McCully-Moiliili Library manager Hillary Chang. That’s not even factoring in regular meetings of groups like Comic Jam Hawaii and MangaBento, or the Space Battleship Yamato live-action film from 2010 screening at the Ward theaters toward the end of the month. There’s something going on pretty much every week — so much, in fact, that I ended up breaking up my customary beginning-of-the-month Ota-cool Incoming! post into three parts, for easier reading. And part 1 focuses on the big-bang kickoff to the month, what I saw as one crazy busy day several months ago: Saturday. 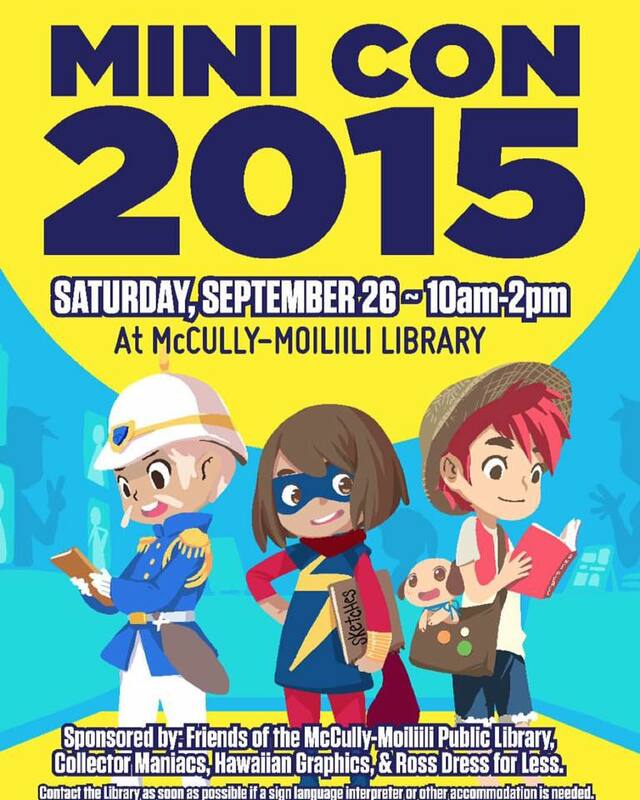 About a 30-minute, 14-mile drive separates the Kawaii Kon-hosted Anime Day at Windward Mall and Mini-Con at McCully-Moiliili Library. 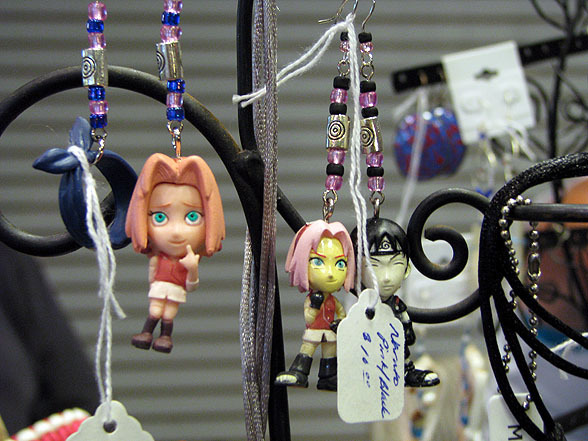 That information will come in handy for the truly hard-core fans among you, as both of those events are happening at roughly the same time — Anime Day from 10 a.m. to 4 p.m., Mini Con from 10 a.m. to 2 p.m.
Jon, Audra and Kevin will all have stuff for sale — Audra in particular will have another lineup of I-wanna-buy-them-aaaaaaaaaaaall original artwork — and Pen & Ink Works will host a workshop at 11 a.m. There also will be free swag to collect (bookmarks! pencils!) and free anime screenings throughout the day. 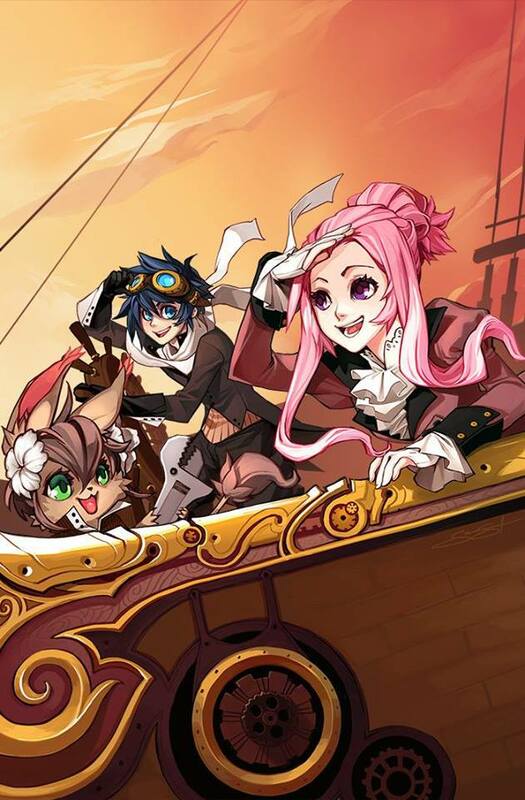 Cosplayers also will receive special prizes just for cosplaying, so go for it! Besides, Hillary’s always unveiled a costume of her own every year. You wouldn’t want her to feel all alone in her creative endeavors. 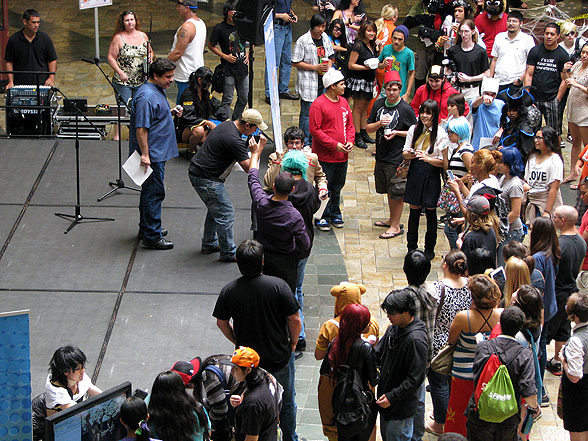 The larger of the two events is Anime Day, which took over a bunch of empty storefronts and the centerstage area of Windward Mall last year. Most of the accoutrements from last year’s event are back this year: cosplay contests, free anime screenings and a dealers room / Artist Alley hybrid (where one of the vendors, I understand, will be a certain beading enthusiast who also writes a popular Star-Advertiser business column, selling anime- and video game-themed jewelry). The Comic Jam Hawaii gang will be hosting the Art Wall and sketching stations as well. The only thing that’s missing is that giant Christmas tree that regularly spewed out artificial “snow” in the centerstage area, but that Anime Day was also held in early December, so there’s that. There’s also the promise of a “few surprises.” If you’ve been keeping track of the Kawaii Kon Facebook page in recent weeks, for starters, there has been that whole “here’s a picture of a particular character … what does this all mean?” running bit … I’m only speculating here, but could we finally be getting some confirmed answers to that question? And will it be, as your friendly neighborhood anime/manga blogger thinks, the announcement of the voice acting trio of Rob Paulsen, Grey DeLisle and Quinton Flynn as guests for Kawaii Kon 2014? We shall see, I suppose. Star Wars Reads Day: May the force of literacy be with you! Eight libraries — Aiea, Aina Haina, Hawaii Kai, Kahuku, Kapolei and Mililani on Oahu, Makawao on Maui and Princeville on Kauai — will be hosting Star Wars-themed giveaways and activities. Aiea will host members of the 501st Imperial Legion and the Mandalorian Mercs, as well as offer activities for the kids, between 10 a.m. and noon. 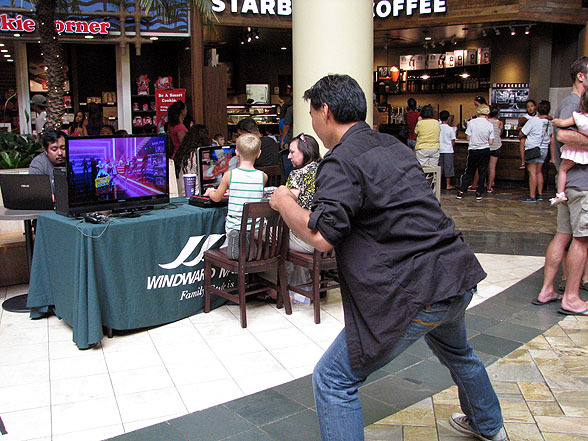 Kapolei will also have 501st members and kids’ activities between 10 a.m. and noon, while Mililani will have a bunch of giveaways between 10 a.m. and 4:30 p.m. Cap it off with a screening of Star Wars: The Clone Wars from 2:30 to 4 p.m. at Hawaii Kai. Visual Kei Dark Castle: A Halloween Party: To get a sense of the vibe this regular visual kei club event is going for this month, please watch this video. And then watch this locally produced homage. Got it? Awesome. Be a v-kei creature of the night and come out to play at Nextdoor (43 N. Hotel St.) from 9 to 11:30 p.m. Saturday. Comic Jam Hawaii: This Sunday is the first one of the month, which means it’s time for another Pearlridge sketch session. Join this group of collaborative cartoon artists from 1 to 4 p.m. and draw to your heart’s content. 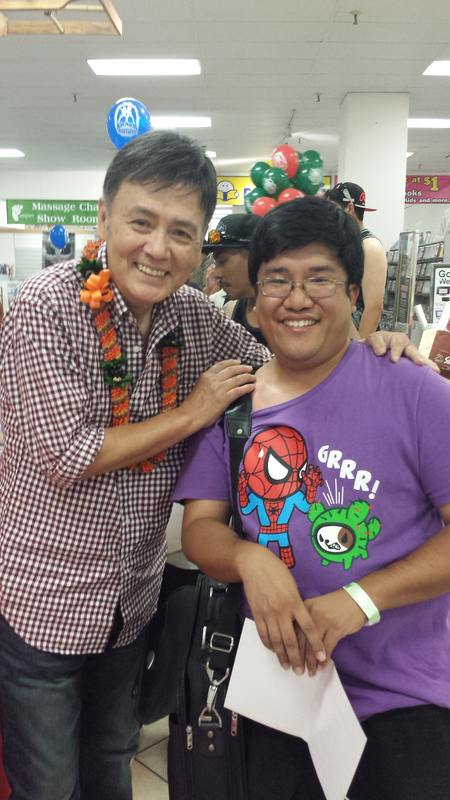 Visit www.facebook.com/groups/ComicJamHawaii. Keep in mind, this is just what’s happening on one weekend this month. Next time, there’s a whole film festival’s worth of material to delve into. And then after that, there’s the rest of the month to cover. It’s going to be a wild ride, folks. Strap in and enjoy. Welcome to this month’s edition of Ota-cool Incoming! … which technically should have come out a few days ago, ideally before Sept. 1, so that I could have gotten one more Comic Jam Hawaii meeting in here. What can I say; work the past few nights, ever since I last posted something here, has been cah-ray-zy. 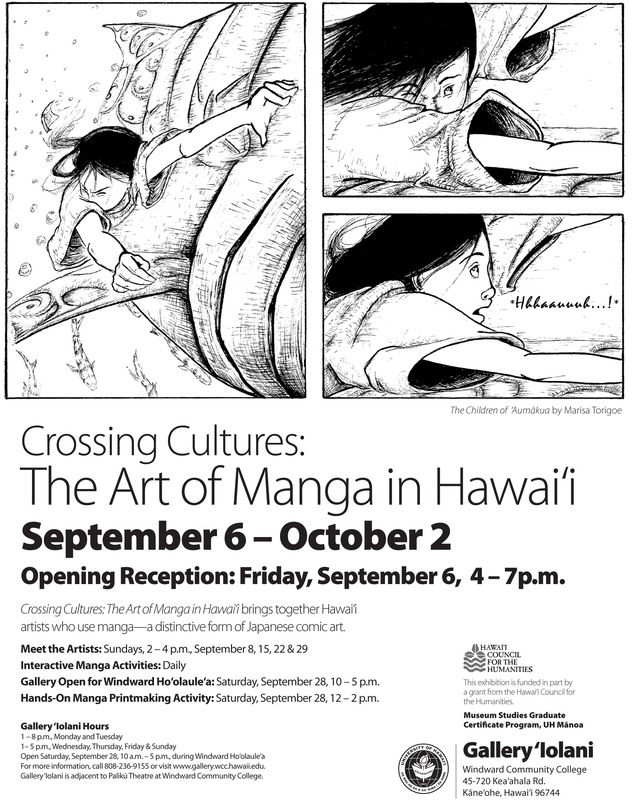 This month’s spotlight event is one for which yours truly served as an adviser: “Crossing Cultures: The Art of Manga in Hawaii.” The exhibit, at Gallery ‘Iolani on the Windward Community College campus, is a journey through the history of manga locally, from its origins in Japan through its influences on the local fan community. There’s a veritable who’s who of local artists and writers spotlighted, including Audra Furuichi (nemu*nemu), Roy Chang (Cacy & Kiara), Jon Murakami (Gordon Rider), Marisa Torigoe (“Children of Aumakua” from the Hawaii Star Manga Project), Stacey Hayashi and Damon Wong (Journey of Heroes), Patsy Y. Iwasaki and Avery Berido (Hamakua Hero), Tara Tamayori (“Eternal Blade” from Hachi Maru Hachi) and Kyunyo (“Emperor’s Seal”). All of this is curated by Brady Evans, Pen & Ink Works founder and Hachi Maru Hachi contributor. The number of special activities tied in to this exhibit could probably fill an average Ota-cool Incoming! calendar by themselves. Start with the opening reception, running from 4 to 7 p.m. Friday. Every Sunday from 2 to 4 p.m. for the duration of the exhibit will feature the curator’s walk-through and artist talks, where you can meet some of the participating artists. And as part of the Windward Hoolaulea (10 a.m.-5 p.m. Sept. 28), the Honolulu Printmakers will be hosting a hands-on manga printmaking activity from noon to 2 p.m., and the gallery will be open on what will be the only Saturday it’ll be open for the exhibit’s run. If you can only make it out to see the exhibit, it runs through Oct. 2; there’s an area where you can sketch to your heart’s content, so at least you’ll have that. Gallery hours are 1-8 p.m. Mondays and Tuesdays and 1-5 p.m. Wednesdays, Thursdays, Fridays and Sundays.